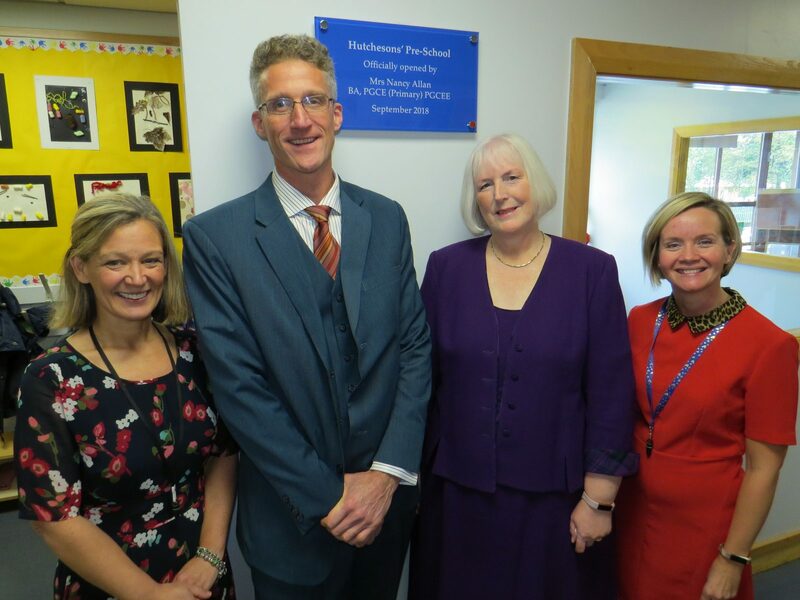 It was a monumental day for Hutchesons’ as the Pre-School was officially opened by honoured guest, Nancy Allan, BA, PGCE (Primary) PGCEE, on Thursday, September 20th. Nancy was joined on the day by Senior Staff, School Governors and Pre-School pupils for the special occasion, with Nancy unveiling the official plaque. Rector Mr Gambles delivered a welcome speech, thanking Nancy and the Hutchesons’ community for their hard work and involvement in making this new venture possible for the Hutchie community. Pre-School pupils then showed the guests around their brand-new classroom and had the opportunity to show off what they have been working on in class alongside their teachers. I am so honoured to open the Hutchesons’ Pre-School today, it has been a privilege to work with the Primary and Pre-School staff on what I have called ‘Project Pre-School. The quality of experience for the children was what always shone through during the planning process and Head of Pre-School, Mrs Dempster, has poured hours into organising and planning activities for the children.